Born on 16 October 1892 in Oldham, Lancashire, England - son of Ellen Parr, Oldham, Lancashire, England - at the time of his enlistment in 1916: present address in Richmond, Bayham Township, Ontario; trade as farming; single; no current or previous military service; Methodist; height of 5 feet 3 inches; chest of 34.75 inches fully expanded; fair complexion; grey eyes; dark brown hair. 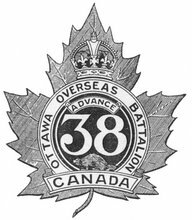 Joined the 91st Battalion, CEF, in St. Thomas, Ontario, on 7 March 1916 (number 190053) - taken on the strength of the 38th Battalion, CEF, on 20 or 21 August 1916 - wounded on 27 June 1917 - struck off strength to the 4th Canadian Labour Battalion, CEF, on 1 September 1917. Awarded the Military Medal [no details in cited records].